Clean, Well-lighted Sentences is a small, engaging book for people who know what they want to write but who aren't entirely confident in their use of grammar and punctuation. This concise, respectful, entertaining guide targets only the most common errors in American sentences. It answers grammar questions like "Should I use affect or effect?" "What will I appreciate -- you attending the meeting or your attending the meeting?" "Am I wishing I was or wishing I were?" "Is the reason why really because ...?" It answers punctuation questions like "What belongs in this spot, a comma or nothing? A colon or semicolon? Does a period go inside or outside a quotation mark? Should the quotation mark be single or double?" After teaching writing for over four decades in a wide variety of academic and business settings, Janis Bell knows the questions that people usually ask. And she knows how to answer in words that make sense, invite a smile, and remain memorable. The chapters on grammar are easy to understand. Each maps out the area of a problem, discusses the wrong turns that writers tend to make, and explains how to get back on track with a compass in hand. And it does all of this in surprisingly plain English. Moreover, there are many examples -- of sentences gone wrong and sentences going right. At the end of each chapter is a quiz, followed by answers, so that readers can see what they learned and what they still need to work on. The chapter on punctuation describes what each of the marks does for a living, as well as the jobs it won't even apply for. Several sample sentences show the marks well employed. And, as in the rest of the book, the most common questions are answered in satisfying detail. 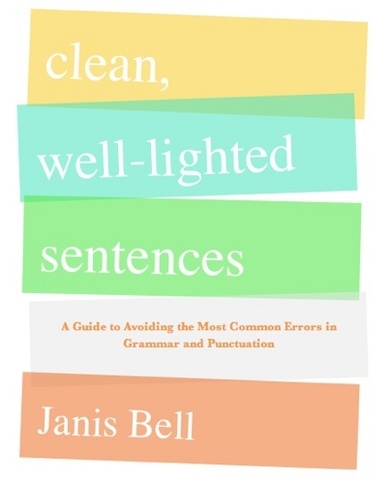 Whether a person is in high school, college, or business, Clean, Well-lighted Sentences is an extremely useful guide and a welcome relief: finally, a text that highlights only the most prevalent mistakes in American sentences -- nothing more.